T-Shirt: Perfect to wear outside of school hours. This super soft baby tee features a "JC" Monogram. Crew neck collar. Short sleeves. Trim at collar 100% Cotton. Machine wash cold, tumble dry low. Made In Vietnam. 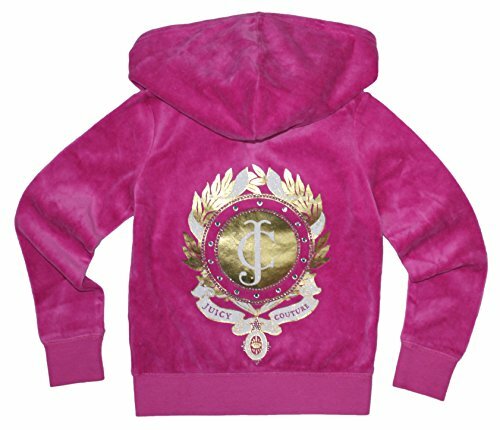 Hoodie: Celebrate fashion in a fun way with a signature velour hoodie featuring a 'JC' Monogram logo embellished with clear crystals. Hooded collar. Long sleeves. Front pouch pocket. Zipper front with J-pull. 78% cotton, 22% polyester Machine wash cold, tumble dry low. Made In Vietnam. If you have any questions about this product by Juicy Couture, contact us by completing and submitting the form below. If you are looking for a specif part number, please include it with your message.